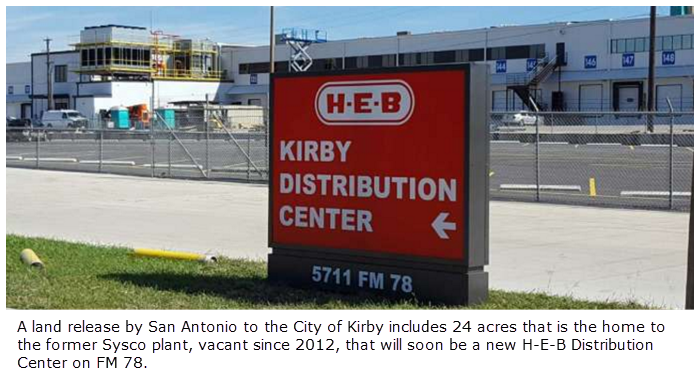 KIRBY, BEXAR COUNTY - In less than a month, a swath of land to the east of Kirby will become part of the city’s territory, bringing with it a new distribution plant and additional jobs and tax revenue. The land given will be home to a new H-E-B Distribution Center on FM 78, bringing with it additional jobs and tax revenue. The 330,000-sf facility has been vacant since its former tenant, food ship​ping giant Sysco moved out in 2012. The swath of land includes 36.4 acres in Tract 1, Tract 2's 32.6 acres of industrial property between Gibbs-Sprawl Rd. and Seguin Rd​., and 24.1 acres along Binz-Engleman Rd. east of Ackerman Rd. ​Check out San Antonio Industrial Market Research.